Users with Microsoft Outlook 2007, Outlook 2010 or Outlook 2013 can now use SpamGrabber - a plugin that makes reporting spam (false negatives) very easy. Download the appropriate version of SpamGrabber. Download "setup2007.exe" for Outlook 2007 and "setup2010.exe" for Outlook 2010,2013 and 2016. Run the setup file and follow the instructions on the screen. Now you have a new tab named SpamGrabber, choose the gear in the icon. Choose Reporting Profiles in the left menu. Click the button Add on the right. In the field Enter a friendly name for new profile, state the name for your new profile, i.e. "ScanMailX Spam". 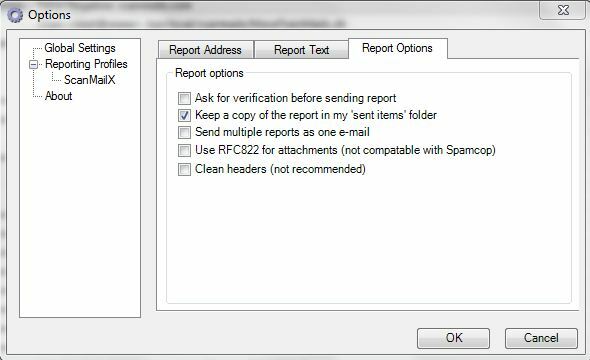 In the field Default address to report to, write spam.learn@scanmailx.net. Click Add (the button to the left). In the left menu, highlight Reporting Profiles. Highlight your newly created Profile in the right field and click the button Spam Default. Highlight the mail in your Inbox you wish to report. Click the red envelope in the SpamGrabber tab to Report Spam. How should I configure the SPF record in DNS? When only using our inbound filter, ScanMailX, there are no requirement from our side to use SPF (Sender Policy Framework) record in DNS but we would strongly advice you to use it anyways. Which email systems does ScanMailX work with? What happens if our mail server is down? Our servers store your emails for up to 10 days in case your mail server is down. Does this mean that we can eliminate our anti-virus software on our PCs? Unfortunately not. Viruses can still enter your network and your PC through any other media you work with and you should still make sure to have your anti-virus software updated. Our services protect you from viruses in incoming emails, but not from entry through browsing, CDs, DVDs or USB keys. How long does it take to register ScanMailX anti-spam solution? To register a domain for our services is quite straightforward. All you have to do is enter the domain you want register with ScanMailX and then ask your internet provider, your web / mail hosting company or yourself to change your domain's MX record in DNS so that mx-scanmailx.com has lower preference than your own server. It is typically only a few lines of text and thus a minutes worth of work. We will then automatically see those changes in DNS, and automatically ensure that your email comes to your server. Does this service slow down my email communications? No. All emails are delivered instantly. Our service is real time which means that all emails will automatically be analyzed as they enter our systems, and if accepted forwarded to your mail server right away. The entire scanning process only takes a few seconds. How must the domain DNS be configured for use of ScanMailX servers? In order for the ScanMailXs filter to filter emails for your domains, you must modify the Mail Exchange (MX) record for your domain. You must insert mxdk01.scanmailx.com and mxdk02.scanmailx.com with same and lower preference than your own mail server so that emails will be sent to ScanMailX first where they are filtered and then sent to your server (mail.domain.com). Many spammers often send to the MX record with the highest preference to try and get to backup mail systems with often weaker spam filtering. To ensure that they do not succeed with this, you should completely remove your own server from the MX configuration. You then just configure within ScanMailX user interface (Advanced configuration) the server we should forward to after scanning is complete. If your internet provider is blocking for incoming mail, you can configure ScanMailX to forward email to another port on your server. This is configured in the Advanced Configuration menu. Remember that this requires that your mail server listens on the SMTP port as you configure. Once you have modified DNS, you can check it through our MX Record Checker service to make sure that the "world" also sees your changes. Will ScanSMTP work even if port 25 is blocked? Yes - ScanSMTP is open on 3 different ports (25, 2525 and 587). We recommend using port 2525.
Who should use ScanSMTP? What should it be used for? Most home or small-business users will find the ScanSMTP service to work just fine for their daily needs. If you do wish to send a newsletter or mailing list, we recommend using opt-in policies, explicit opt-out instructions on each email, and other procedures as required by the US CAN-SPAM Act, our Acceptable Use Policy and general e-mail etiquette.